I first met Aldrine when he was fifteen years old, back in the last century when we held EKK in the church parish hall. When some musicians could not make it to EKK, Fran Nestel invited the Kauai High School Hawaiian Club to perform at EKK. A whole group of very talented high school students showed up and Aldrine was a standout. Twelve years later and in the 21st century, here is Aldrine looking pretty much the same but now twelve years older and whole lot more experienced. My favorite story about Aldrine was told to us by Aunty Stella Burgess from the Hyatt who used to drive the school bus for Koloa School. Stella picked him up at kindergarten to drive him home but Aldrine did not know where he lived….now the roads in Koloa are not neatly gridded streets and avenues like on the mainland so you need to drive in and out of small camp roads to get to the houses, so Stelle did that until they found his home. Now a world traveler, Aldrine travels all over to perform but always finds his way back to Kaua’i…so let’s give Aldrine a big Kaua’i welcome home. Aldrine made a correction that at that time he was in the second grade so had no excuse to not know where he lived. However, being an 8-year old first generation Filipino who had just moved to Koloa the day before was his excuse for not knowing where he lived plus all the streets had Hawaiian names which he cannot pronounce . . . even to this day. He considers tonight his homecoming to Kaua’i as he just got off the plane after spending three weeks helping a young ‘ukulele player in Victoria, Canada. Aldrine wanted to share his personal experiences and insights on the topic of the ‘ukulele. Going back to Aldrine’s first public performance at EKK when the Hawaiian club showed up with matching aloha shirts, the Hawaiian Club members got together every lunch hour to watch the video of their first performance. They thought at that time “it’s never going to be better than this” but now when they look at the tape they want to throw it away. That is how much they have grown in their musicality. Aldrine today is the ‘ukulele instructor on a website called “Ukulele Underground” which originally started as a little program under <www.IAmHawaii.com> with Aaron Nakamura videotaping the lessons. The mission of the website is to build a whole new generation of ‘ukulele players. When the website owners decided to focus on the Japanese-Hawai’i market, many programs were “let go,” including the ‘ukulele lessons. Out of concern for the roughly fifty loyal ‘ukulele players who posted constantly, the program kept going s a separate entity with the name “Ukulele Underground.” Today they cater to ‘ukulele players all around the world with about a million and a half views per month, boasting 60,000 registered members with 6,000 actively logging each day to either “Learn the play the ‘ukulele” or “Learn to play the song”. They are now expanding to new areas such as “Learning how to build an ‘ukulele.” Not bad for someone who could not find his way home; now the entire ‘ukulele world is home and family to him. Although Aldrine was always playing the ‘ukulele, he went to school to become a teacher, worked as a pool boy in a local hotel and one day just threw in his rake and quit his job to focus on what he loved most — play the ‘ukulele. He hooked up with Jake Shimabukuro as his mentor and focused on developing his own style and writing his own ‘ukulele compositions. Many of these original songs were played for the appreciative audience. Among them were “Schizophrenic Snowflake” where both his playing and his body movements expressed the feeling of the first snowfall, “Bandido Tyler” who was inspired by his unsuccessful superhero friend who stole from the rich to give to the poor but was always trying to get away from the cops and getting caught, and Tyler’s nemesis “Senor Victor” who was always out to get Bandido Tyler. “Only Mine” was a song for his ‘ukulele but also for that special girl. Aldrine traces the progress of the ukulele as waves and that we are now in the third or fourth wave…first wave being the time when the Portuguese fist introduced the ‘ukulele in Hawai’i. Later, Elvis and Hollywood gave the ‘ukulele renewed attention but this time the ‘uke was viewed as a toy instrument. About the same time, Tiny Tim, who is known as the “Patron Saint of Awesome” to the members of “‘Ukulele Underground,” gave a new life and outlook to the humble instrument. In Hawai’i, the ‘ukulele played a big part in Hawaiian music. 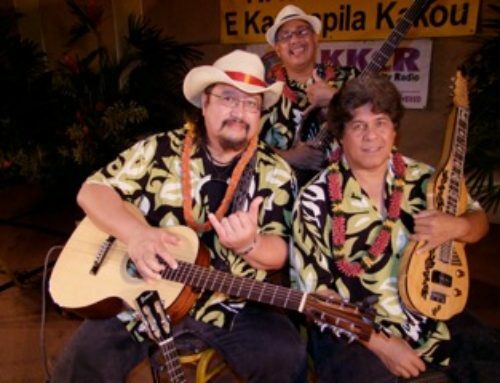 Innovators such as Ohta-san, Troy Fernandez, Eddie Kamae, Ka’au Crater Boys, Peter Moon, Lyle Ritz and Jake Shimabukuro changed the way the instrument was played. Although the big question is, “Is the ‘ukulele just a fad this time?” Aldrine feels that the big difference about the ‘ukulele is that there are ‘ukulele clubs forming all over the world. Last year he went to Thailand for the ‘ukulele club convention and there were between 3,000 to 5,000 participants; this year 7,000 showed up. Aldrine said you would never find clubs with guitar players, dijiredoo players or flute players, but ‘ukulele clubs are popping up all over; the ‘ukulele is an instrument of peace that brings people together. He also feels that the ‘ukulele is magical and has healing powers. Case in point. He just returned from Victoria, Canada, where he was invited to help a young boy in the ‘ukulele underground club who amazingly was able to figure out Aldrine’s complicated arrangements. Victor was recently diagnosed with a brain tumor and not given much chance for survival. Benefit concerts were held to help him with medical expenses. Where doctors said that little could be done to help Victor, through his music he has now learned to speak again, is now able to walk, and is beginning to play his ‘ukulele again. 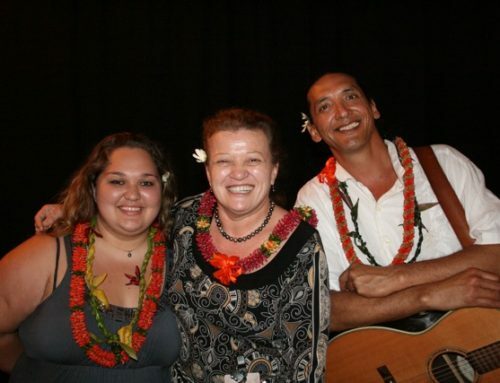 Even if Aldrine has trouble pronouncing Hawaiian words, he lets his ‘ukulele say it all, so he started out with a Hawaiian tune titled “Healoha no Honolulu.” He shared his own arrangement of songs by artists he admired. Some of the songs included “Strawberry Fields Forever,” “Something” by John Lennon, “Under the Bridge” by Red Hot Chili Pepper, “Me and Shirley T” by Jake Shimabukuro about getting a sugar high on too many Shirley Temples, Van Morrison’s “Brown Eyed Girl”, “Drift Away,” “Somewhere Over the Rainbow” in the Judy Garland style, “Close to You” by the Carpenters, and John Lennon’s “Imagine” which is his favorite song of peace. It was so quiet when he played the song with such sensitivity that you could hear a pin drop in the ballroom. The varied styles ranged from quiet and sensitive, to wildly percussive, to gently melodic, and on and on. “I have ten more songs I want to play,” but there was time for only two more, so he ended with a song dedicated to his early mentor, the late Kaui Low who was a huge early inspiration to Aldrine. I remember that he played it that first night in the church parish hall when he was fifteen years old, but after suggestions for improvement from teacher Jake Shimabukuro, he played it even better by inviting the audience to egg him on as hey played “Crazy G” faster and faster and faster until his fingers were a blur. He knows how to end on a high note.